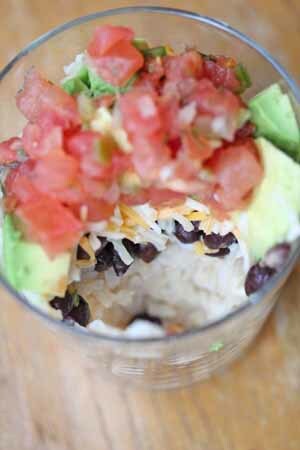 We’ve all seen (or had) the 7 layer dip cups to serve at parties. But what about dinner in a cup. 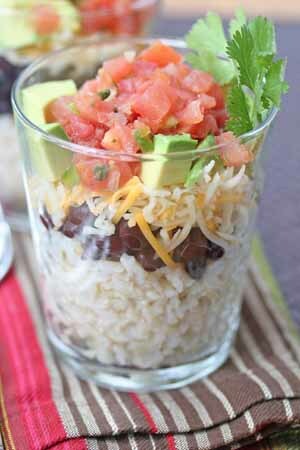 Specifically, burrito dinner in a cup. Sure burritos, require tortillas…but what if you can’t eat tortillas. When we had these for dinner the other night, I found less of a rice mess on the table. When rice in a bowl, or on a plate, it tends to end up all over the table and under the table. And stuck onto the chairs. But there was much less mess with these cups. I guess because the rice was easier to scoop out of the cup and not fall all over the place. And since the entire meal was served in the cups, there was less mess to clean up after dinner too. I laid out all the ingredients as if we were having a taco bar. Then started filling cups! 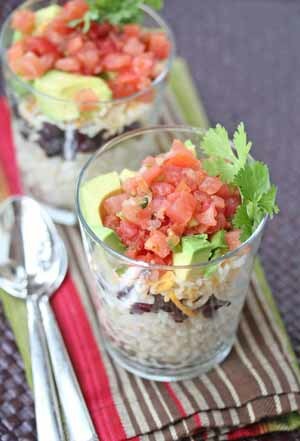 Set out the black beans, shredded cheese, diced avocado, and salsa (along with any other mixins). Spoon the ingredients into cups. Eat. Repeat. Serve Burrito Cups, as is, or with tortilla chips. Or in tortillas. What a delicious and frugal alternative to traditional burritos! I am sharing my southwest quinoa salad this evening. That looks great! What a fabulous idea. I love the quick cleanup, too! Thanks so much for the linky. Stop by and check out my cheap recipes and link up your money-saving recipes to Frugal Food Thursday. And I’ve linked your recipe to StumbleUpon! I am excited to try this. Pinned it and have seen that one person liked it and another 4 have re-pinned. Yay! Thanks so much! This will help me. Am trying GF diet and I love the idea of a cup! We made these last night – they were DELISH! My 6 year old LOVED them and thought it was super fun building his own cup. Thanks for yet another fun, delicious, and affordable dinner! This looks so delicious. Will definitely be trying the recipe. New follower of your blog. Love it! Please send me recipes via email. Glad to hear this type of diet is helping for your son. Thanks for the quick and inexpensive dinner idea. It seems like these burrito cups would be great to take on the go. I am a director for a non-profit that supports adults with DD. We run a daily lunch program and I am ALWAYS on the look out for healthy and inexpensive lunch ideas! We charge $3.00 for lunches here and they are always freshly prepared and wonderful, problem I would like to solve is the cost. I would like to keep our total meal cost under $2.00 per person so we can use the money we earn from the lunch program for programming materials, pizza parties, etc. If you have any suggestions PLEASE send them my way! I love this recipe idea. If you are watching gluten, also watch your salsa brand. Some salsas contain gluten. Newman’s Own does not have gluten and I believe the Old El Paso brand does not either. Really amazing, i love burrito and I’ll try this recipe for sure.